Poppin' Cookin' SG! : Hi all! 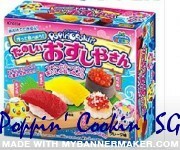 Also, the supplier we're getting the Popin' Cookin' Sets from are selling the Konapun kitchen set too! Do tell us what you think and if you really want the products!! We will be more than happy to fulfill your requests!